Which is Better? It isn't as stressful as you think! Can we just have a light conversation about something that comes up at least once a day with patients? It is inevitable. 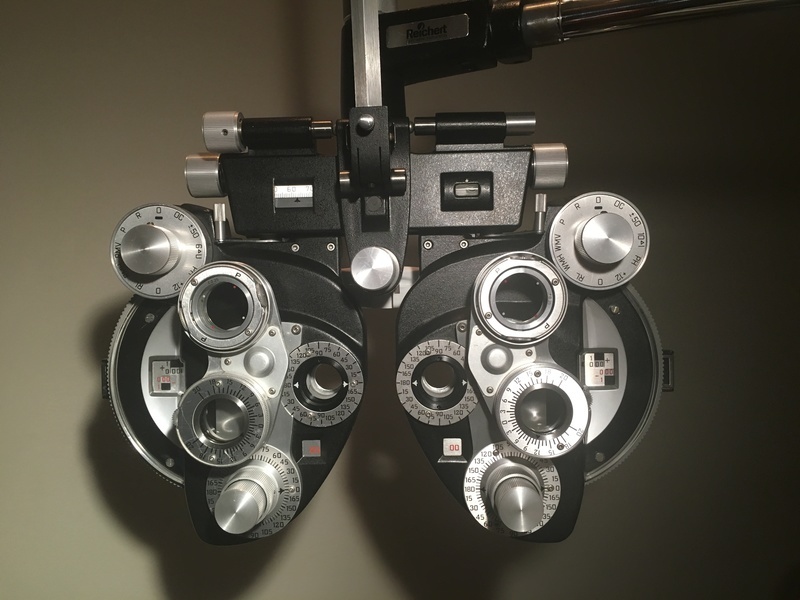 At some point, usually more than once, I’ll have a patient inform me that the “Which is better, 1 or 2?” test stresses him or her out to the point that they hate coming to the eye doctor. Let me take a few minutes to put your mind at ease. First, I promise you, we are not trying to stress you out. Or trick you. Seriously, we aren’t. When the options get really similar and it is difficult to tell the difference between options, it means we are close to getting your glasses prescription right where it needs to be. Often, we don’t even need you to tell us that you can’t tell the difference between two lenses. We can hear it in your voice. Once we pick up on the fact that you’re struggling to differentiate the two options, we usually move on to gathering whatever information we need next. This process is all about refining your prescription so that you can see not only clearly, but comfortably. Here’s a little run down of how determining your prescription works. Stay with me; I’ll try not to get too technical. First, we often will use your old prescription information and/or some of our equipment called an auto-refractor or retinoscope to get a base-line for your prescription. It is essentially an objective way to see if you need glasses, and if so, what the powers need to be. We also use it if we have a young patient or a special needs patient who may not be able to do the subjective refraction (the "which is better, 1 or 2?" portion) of the exam. Then, we move on to the subjective refraction, which is where we will ask you to compare some lens options and give us your feedback. There really isn’t a right or wrong on this. We are asking for your preference on how you see. The numbers are just a way of labeling the options. Some doctors will only use "1" and "2" as an option. I like to go in two’s up to "7" or "8". It’s just personal preference. We could ask you if you like “cats” or “dogs” if we wanted, but that leads to people answering with their actual preferences, rather than which way the letters look clearer. Most of this process is refining the astigmatism portion of your prescription. Side note: astigmatism is not a disease. It literally means that the light that comes in to your eye focuses all over the place instead of in a single spot, making sharp edges blurry. The whole “your eye is shaped like a football instead of a basketball” analogy is confusing to me, and I like sports, for whatever that’s worth. More on astigmatism later. In any case, astigmatism (if you have any and most people do), can be located in any direction. Refining your prescription by asking you which choice you prefer is important because this part of your prescription basically describes the closest and furthest points of focus in your eyes. What should you get from all this information? The take home here is that determining your prescription shouldn’t stress you out. Just trust your instincts and make a choice. Or don’t and tell me that the choices look the same. It just means that we are on the same page and your new glasses are going to be nice and clear. It really isn’t as high-pressure of a situation as it is often made out to be. You can’t make a wrong choice and saying the "wrong" one isn’t going to make your eyes worse. Let me say it once more time: We aren’t laughing behind your back because we showed you the same thing twice. Oh, and your kids can’t fake us out during refraction, regardless of how much they do (or don’t) want glasses. Thanks for reading and check out our other social media pages! I hope you’ll continue to follow us and come visit once we get our doors open.